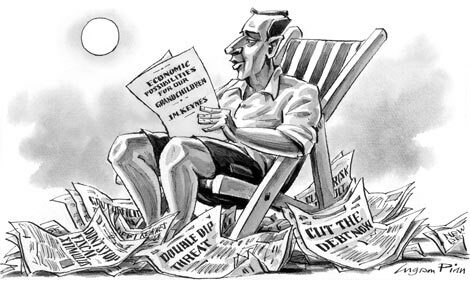 It says a lot about the talents of John Maynard Keynes – and just as much about the shortcomings of modern macroeconomics – that when the financial crisis struck, policymakers instinctively reached not for their fancy models, but for the Keynesian idea of fiscal stimulus. These pages have been filled with eminent thinkers arguing over whether it is time to bring the stimulus to an end. Perhaps we should turn the question around: if stimulus were to be the solution, what would be the problem? The problem would be that too many of us wanted to save money or pay off debts; that is, we wanted others to pay for our services but weren’t so keen on paying for theirs right now. Simple arithmetic suggests this would leave slack in the economy. In addition, the problem would be that businesses, pessimistic about prospects for recovery, didn’t harness all the spare savings floating around and plough them into new investment projects. The slack would stay slack, possibly for a long time. If that was the problem then government stimulus would be the solution. And the above paragraph doesn’t seem to be a bad description of the US or UK economy, which suggests the case for stimulus is strong. True, the patience of the bond markets is surely not boundless (and say what you like about kowtowing to the markets, if we’d like them to lend us money we have good reason to care whether they are willing to lend it). And there already is an awful lot of stimulus spending going on right now, so it’s not absurd to suggest we could get by with less as the economy bounces back. I realise that I am sitting on the fence here, but it’s part of my new maxim, which is never to stand in the middle of a fight between Paul Krugman and Niall Ferguson. The quality of government spending still matters. If you think the multiplier is 2.5 then you can gladly follow Keynes’s suggestion of burying banknotes down mineshafts and leaving it “to private enterprise on well-tried principles of laisser faire to dig the notes up again”. If you think it is 0.5 or zero, you might want government projects chosen with more care. And as Keynes himself remarked, no matter what the multiplier, “it would, indeed, be more sensible to build houses and the like” if only politics would allow. Keynes’s General Theory may well be a work of genius, but I have always been more attracted to his short 1930 essay, Economic Possibilities for Our Grandchildren, in which, in the teeth of the Great Depression, Keynes reminded us that the long-run trend was inexorable growth. “I would predict that the standard of life in progressive countries one hundred years hence will be between four and eight times as high as it is to-day,” he wrote. After 80 years, a world war, and a depression, citizens in the US and western Europe are about five times richer than when Keynes was writing. We seem to be on track. Keynes’s essay explored something his modern disciples often ignore, namely what would happen when “the economic problem” was solved. By the standards of the 1930s, this problem has been solved. But our response has not been what Keynes expected. He acknowledged that human beings had an insatiable desire to feel superior to each other, and that some people would always blindly pursue wealth. But he felt that most of us would adjust, albeit grudgingly, to a life of plenty. We would work less and amuse ourselves in other ways. We have not, and civilisation continues to depend on the production, purchase, consumption and disposal of the kind of stuff you can see anywhere from the shelves of Walmart to the pages of How To Spend It. One of the multiple causes of the crisis, after all, was that so many people wanted to borrow more than they could repay. It is true that we do choose to work a little less. According to the economists Mark Aguiar and Erik Hurst, despite a large increase in women’s participation in the workforce, in the US they have at least four hours a week of extra leisure compared with 1965. Men have at least six extra hours. And there is the time we spend studying and travelling before our careers, or in early retirement, to say nothing of the many hours spent goofing off at work and looking at Facebook. But if you want to work a three-day week, your boss and colleagues will assume it is because you are caring for a baby or studying for a PhD, rather than because the weather is lovely at this time of year. So while the debate of the day is rightly about how quickly and how severely governments should tighten their belts, I hope that when the crisis is over we will remember to come back to Keynes’s long-run forecast. Keynesianism may be about trying to maintain full employment, but Keynes understood that full employment could mean everybody who wanted a job working up to three hours a day, at which frenetic pace we should still have twice the wealth of Keynes’s generation. It was in this future paradise that Keynes famously imagined that the economics profession might be thought of as “humble, competent people, on a level with dentists”. We economists have a way to go yet.